*Since I did the sampler and didn’t plan on staying long I only took partial notes. Pours a clear gold with a filmy head. Splashes of lacing along the glass. Nose is very muted with mild hard water/sulphur notes and hints of earthiness. Smells similar to a British Pale Ale. Taste is just as mild, with hints of sweet toffee and grassy hops. Mouthfeel is light and smooth. Easy drinking, but not at all what I’ve come to expect from a pale ale. The beer poured a dark brown, almost black color. Head was a creamy brown. Nose was dark roasted malts with a touch of medicinal hops. Taste starts with dark roasted malts with a touch of coffee. It ends with just a smidgen of earthy/medicinal hops and a sweet raisin flavor. Mouthfeel was medium and slightly creamy. This tasted like a hoppy porter, which isn’t a bad thing. I wish the hops were a little more pronounced, but it wasn’t as unbalanced as some black IPAs I’ve had. Pours a dark brown with regular brown highlights. Head is a ring of tan that sticks around for the duration. Nose is a touch of roasted malts with a heavy caramel/toffee sweetness. The toffee comes back big in the taste with just a touch of roastiness to change things up. But that’s about it. Mouthfeel is lighter than expected and almost watery. It leaves an aftertaste that reminded me of drinking hard water. This was not my favorite. I expect more roastiness from a schwarzbier and there really wasn’t any. It was basically a dark amber ale. Pours a clear yellow with a bunch of very busy bubbles. Head is a ring of white bubbles that were constantly popping. The nose was practically nonexistent. Seriously. The taste was full of cream corn and butter. Mouthfeel is bubbly and light. I’m not the biggest lager guy and I won’t admit to being on expert on Helles lagers, but I have to think that the buttery cream corn flavor wasn’t completely intentional. It’s not the worst thing I’ve ever tasted in a beer, but drinking more than a 4 oz. taster might have been difficult. As a HELLES LAGER: ??? Pours a mahogany/garnet color. Head is a filmy off-white. Nose was sweet with notes of caramel and raisin/fig. Taste isn’t bad. It reminded me of cereal malts with a touch of caramel sweetness. Not a bad beer, but nothing really stood out in the flavor. This would make a good session beer, but it’s nothing to crow about. 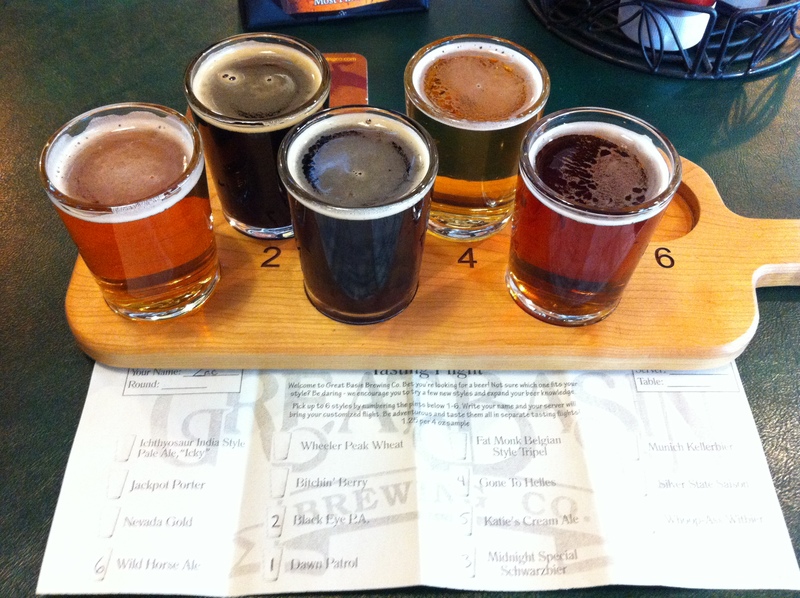 Overall, the Great Basin beers tasted like microbrews made for macrobrew fans. Nothing really stood out or showed any ingenuity or risk taking. As I was there sampling there beers a large group of elderly US military veterans came in for lunch and it struck me that they might be the type of people who would enjoy Great Basin’s output.